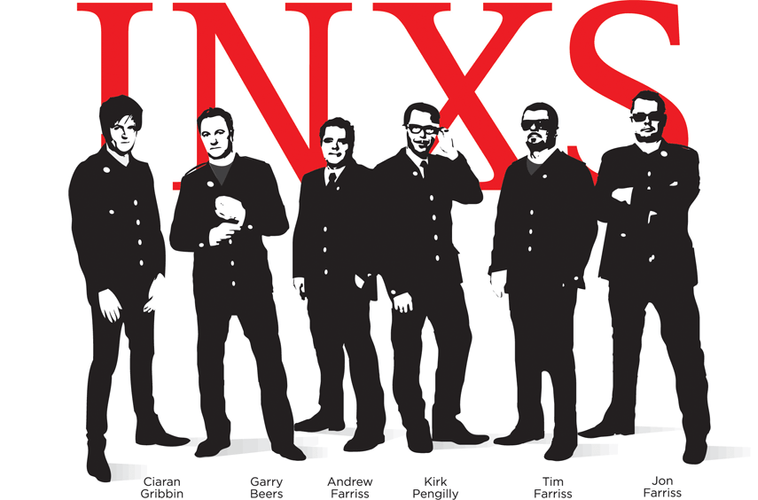 INXS are an Australian rock band, formed as The Farriss Brothers in 1977 in Sydney, New South Wales. Mainstays are Garry Gary Beers on bass guitar, Andrew Farriss on guitar/keyboards, Jon Farriss on drums, Tim Farriss on lead guitar and Kirk Pengilly on guitar/sax. For twenty years, they were fronted by Michael Hutchence on lead vocals, whose "sultry good looks" and magnetic stage presence made him the focal point of the band. Initially known for their New Wave/ska/pop style, they later developed a harder pub rock style, including funk and dance elements. In the early 1980s, INXS first charted in their native Australia with their debut self-titled album, but later garnered moderate success elsewhere with Shabooh Shoobah and a single, "The One Thing". Though The Swing brought more success from around the world, its single "Original Sin" was even greater commercially, becoming their first number-one single. They would later achieve international success with a series of hit recordings through later in the 1980s and the 1990s, including the albums Listen Like Thieves, Kick, and X; and the singles "What You Need", "Need You Tonight", "Devil Inside", "New Sensation", and "Suicide Blonde". In the 1990s, the band brought a new audience following Hutchence's romance with pop singer Kylie Minogue, and achieved greater acclaim in the UK. However, starting with Welcome to Wherever You Are, in 1992, they achieved less success in the United States. A depressed Hutchence committed suicide by hanging in 1997 and INXS did not perform publicly for a year. The band made appearances with several guest singers including Jimmy Barnes, Terence Trent D'Arby, and Jon Stevens; Stevens formally joined the band for a tour and recording session in 2002. In 2005, members of INXS participated in a reality television series, broadcast worldwide, culminating in the selection of their new lead singer, Canadian J. D. Fortune, and the release of "Pretty Vegas" and "Afterglow" as singles, and its album Switch. In late 2010, they recorded and released Original Sin, a tribute album, featuring guest artists such as Kavyen Temperley (of Eskimo Joe) and Ben Harper. In September 2011 the band announced that Northern Irish singer-songwriter Ciaran Gribbin had replaced Fortune as their lead vocalist ahead of a planned tour of South America, Australia and Europe later in the year.